We’ve said it once: We’ve said it dozens of times probably. Abbot of Keral Keep is one of many cards from Magic Origins that is poised to make an impact in the Modern format. What are some of the areas where Abbot of Keral Keep can be effective in Modern? How does it differ from Snapcaster Mage in some of the existing Modern shells? Unlike Snapcaster Mage, Abbot of Keral keep does not combine well with permission spells. Not only does it not have flash, but flipping a permission spell with Abbot of Keral Keep will generally cause that card to brick. Abbot of Keral Keep has great potential synergy with proactive cards. Think about Abbot of Keral Keep flipping over, say… An Inquisition of Kozilek. The combination of cheap cards and card advantage — and cheap cards and prowess — are both synergistic and valuable. 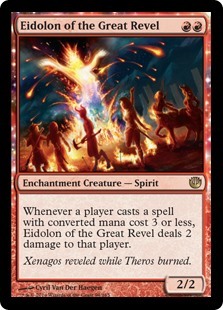 How about a Naya Burn deck in Modern? 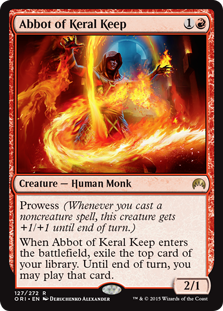 Abbot of Keral Keep can hook up with the efficient burn spells available in Modern to give an aggressive deck some extra oomph. Sphinx’s Tutelage is the definition of “scissors” (as in rock-paper-scissors). If you can get to the top tables with it, Sphinx’s Tutelage can lock up a tournament for you. You learn a lot about what's a powerful deck and what's a metagame call, the week after the Pro Tour. What does that say about decks from the Pro Tour (like U/R Ensoul Artifact or Mono-Red beatdown), and how does it help inform go-forward metagame decisions in Standard? This deck lines up against [the Pro Tour-winning] Mono-Red deck on the fundamentals: Its cards just line up well against the Red Deck’s cards. This deck has great options against the [It! Girl! breakout] U/R Ensoul Artifact deck. Unravel the Aether, for example, doesn’t care how “indestructible” an artifact might be. How about that Sphinx’s Tutelage deck? 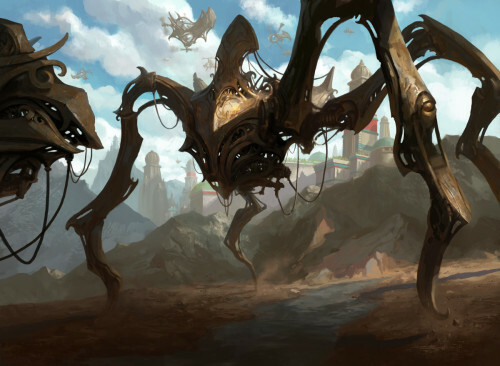 With Abzan Control and G/W Megamorph so successful, U/R Sphinx’s Tutelage was a great choice! The deck can strand the heavy creature removal of Abzan, and easily race its powerful-but-slow threats with Sphinx’s Tutelage itself. While this deck is full of card drawing — and was designed by Andrew Cuneo — make no mistake: This is a VERY offensive deck. 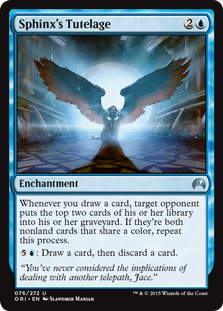 Those card drawing cards aren’t just there for filtering and card advantage… With Sphinx’s Tutelage, they are there to kill you. Back to Nature wipes the floor with Constellation! Remember Back to Nature? Tragic Arrogance doesn’t care how many enchantments you have… It blows up [almost] all of them. Tragic Arrogance is a card people are already playing, and [Grand Prix Top 4 competitor] Paul Rietzl even ported a Tragic Arrogance into a former End Hostilities slot of his Abzan Control deck.